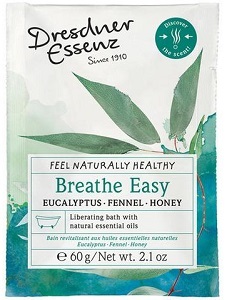 Dresdner Essenz Breathe Easy Herbal Bath has a base of pure Sea Salt and contains the essential oils of Eucalyptus and Fennel that promote your general health and well-being, even if you are at risk of catching a cold. When combined with warm or hot bath water, the vapors from these oils aid your respiration and have a revitalizing effect you can feel. Likewise, the natural Honey has a balancing effect as it calms and soothes. This bath also contains Sesame oil combined with Wheat protein and Panthenol to provide gentle care that leaves the skin feeling noticeably soft and smooth. Contains no PEG emulsifiers, no alkaline soaps, no sodium laureth sulfate, no mineral oils and no silicone oils. Not suitable for children under 3 years of age. Li-iL Werke, the makers of Dresdner Essenz herbal baths, was founded in Dresden, Germany in 1910. Guided by the principles of aromatherapy through over 90 years of experience and scientific study, they have worked to develop and continually improve the beneficial, nourishing and effective luxury herbal bath products which they proudly offer today. Dresdner Essenz - the ultimate health and well-being bath experience!